6BR/3BA colonial home with many updates throughout! Updates include: custom kitchen with granite counters, french doors, private yard, cathedral ceilings, and more! Over an acre of yard right in the town of Cincinnatus. Call today for more information! Cincinnatus Elementary School Pre-School, Elementary School / Public 2 0.45 mi. Cincinnatus Middle School Middle School / Public 5 0.45 mi. Cincinnatus High School High School / Public 7 0.45 mi. Cincinnatus Christian Academy * Pre-School, Elementary School, Middle School, High School / Private N/A 3.43 mi. Marathon Christian Academy * Pre-School, Elementary School, Middle School, High School / Private N/A 9.39 mi. William Appleby Elementary School * Pre-School, Elementary School / Public 4 8.89 mi. 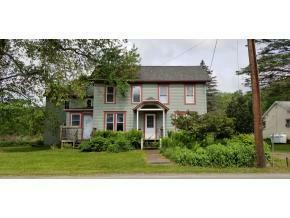 2719 State Route 26, Cinncinatus, NY 13040 is a 6 bedroom, 3 bath single family home was sold for $95,000.